Duel Knight returned with week with five exciting match-ups. The top match of the night was NM Ian Harris vs. Zachary Tanenbaum. Harris’s winning 3/3 score is deceptive as Tanenbaum nearly won two of the games. 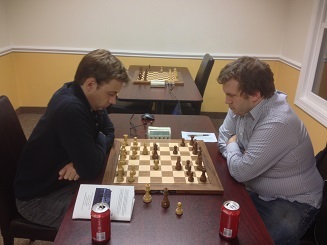 Locals Daniel Cooper and Vladimir Kotov played two G/45 games. In the last encounter Kotov had gotten the best of Cooper, however Cooper was set on revenge and won both games! 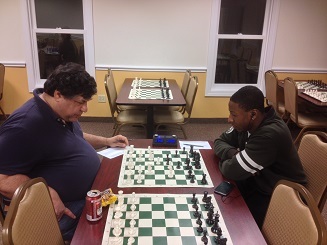 One of the closest match-ups of the night between CCFC Director Melvin Patrick and Guy Colas became a lopsided win for Colas. Meanwhile, Rich Tanenbaum won convincingly against Carl Scovens. 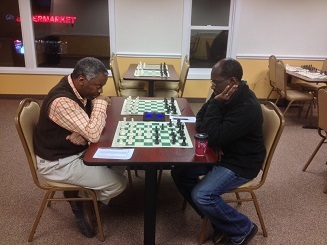 However, Scovens continued to put up stiff resistance to draw the third game. 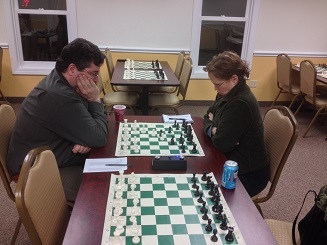 In a developing rivalry, Al Pinto and Wendy Cummings faced off in the three game G/30 match. Cummings won the first game but Pinto struck back winning the next two!